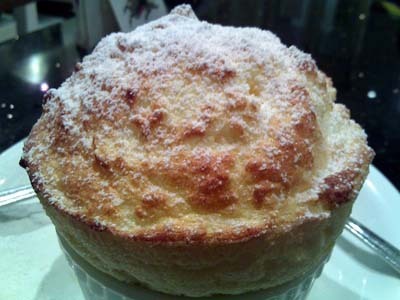 One of the most famous French desserts, the Grand Marnier Souffle recipe is one of the easy French desserts to prepare. The most important factor in preparation is that your egg whites need to be beaten properly (so they are smooth and stiff). 2. Using a 6 cup soufflé mould (3 ½ inches deep) Butter the inside of the mould and sprinkle with granulated sugar to coat. Discard excess sugar. 3. In a 2 ½ quart saucepan add 3 T flour and whisk in a bit of milk. Blend in orange zest, the rest of the milk and 1/3 c + 2 tsp sugar. Stir over moderately high heat until it thickens and comes to a boil. Boil, stirring for 30 seconds. Sauce will be very thick. Remove from heat and beat 2 min to cool slightly. 4. Separate 1 egg. Put white into a bowl and set aside. Drop yoke into the sauce and beat in with a whisk. Continue the same with each yoke. Beat in 1 T butter. Dot top of sauce w/ 1 T butter to prevent a skin from forming. 6. Into the sauce base, stir in 2 tsp vanilla extract and 3-4 T Grand Marnier. 7. Stir ¼ of the egg whites into the saucepan with the sauce. Then fold in the rest of the egg white, careful not to deflate the egg white. 8. Turn soufflé mixture into the prepared mould, leaving 1 ¼ inches from the top. 9. Place mold in the middle level of oven and turn down temperature to 375 F.
10. After 20 min (soufflé should have begun to puff and brown) quickly sprinkle top w/ powdered sugar and return to oven. 11. After another 10 – 15 min top should be browned. With a thin skewer or thin long knife insert carefully into the side at a 45 degree angle, it should come out clean or just slightly moist. How did it turn out? Want to try more? Check out my other French dessert recipes. The Grand Marnier souffle recipe uses, of course, Grand Marnier. Grand Marnier comes from the Poitou-Charentes province of France in the wine region of Cognac, 100 miles north of Bordeaux. 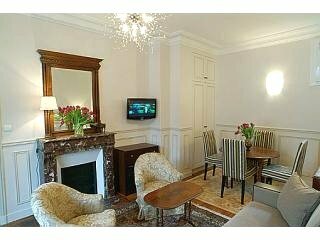 …more about French wine regions. The Poitou-Charente has a beautiful coastline on the Atlantic so if you’re interested in France Beaches, check this out . Having a romantic dinner? A great occasion to try out some of these French love phrases.